If there’s one thing that truly concerns me, it’s senior military leaders who did not take a stand. I can’t tell you how many times I’m asked why the current crop of senior military leaders do not stand up for the men and women in uniform. Why aren’t they speaking out more about the Obama administration’s social engineering experiment in egalitarianism and political correctness? Why don’t we have these leaders addressing critical issues such as mandates on lactation and the insidious rules of engagement? We have shared with y’all here on countless occasions the troubling issue of military readiness and the decimation of our armed forces capability and capacity. Everyone seems to believe a drone strike here or there is the panacea to defeat Islamic jihadism — well, Osama bin Laden is dead, did that stop anything? Now, perhaps you can excuse the ones still serving in uniform, but one thing is for certain, those who are retired should have no fear. Recently, we chided former Chairman of the Joint Chiefs, and Chief of Staff of the Army, General Martin Dempsey, for admonishing retired Generals for speaking out. I wonder if General Dempsey has anything to say about what we’re about to share. As reported by Real Clear Defense, David Petraeus and Michael O’Hanlon, both accomplished professionals, have reached the pinnacle of their respective career fields. General Petraeus led the “Surge” in Iraq, one of America’s greatest military achievements, while Dr. O’Hanlon was among the first scholars to recognize, against the judgment of his peers, that the “Surge” had changed the facts on the ground in Iraq. That’s why their calling talk of a crisis in U.S. military readiness a “myth” is a head-scratching disappointment. Their assessment is based on four seemingly reasonable points. First, in aggregate terms, America now spends more on defense than it did on average during the Cold War and more than it did in the year prior to 9/11. Second, there is a sustainable $100 billion available in the Defense budget for capital investment, which is backed by the most innovative defense technical industry in the world. Third, while some equipment is aging, most of what the military has is in good shape. And finally, we have the best people of any military in the world. While each of these assertions may be correct, they provide only half the story. Successive Army Chiefs of Staff have expressed concerns regarding the level of risk associated with the reduced size of today’s land forces—the Army is smaller than it has been since the 1930’s. Retired General Carter Ham, who heads the Association of the United States Army, has cogently argued this point. The Navy’s leadership has also raised the alarm that today’s fleet is some 50 ships smaller than is needed to meet the Navy’s existing requirements, and the Air Force Chief of Staff recently warned that our pilots are getting about half the training time they used to get. While pilots operating forward are trained adequately, home station training is inadequate, which creates risks if other contingencies arise. The professionalism and dedication of our uniformed service members can paper over these inadequacies, but there is a limit to that resource as well. We have placed a great burden on our warriors and their families. While they continue to carry the load, we should never take that for granted. Additionally, we rely on part-time, Reserve forces more than ever to meet our global commitments, creating pressure on families and employers, which could lead to a breaking point. This explains the skyrocketing costs of military compensation and benefits over the last decade plus. If our Department of Defense were to completely go away, we would still be running deficits in America, we would still have a massive debt. Our defense budget is only 18% of our overall federal budget. It is about about 3.3% of our GDP, which is anemic at 1% growth. Some 64% of our federal budget is dedicated to the mandatory spending programs of Social Security, Medicare, Medicaid and the net interest on our debt. I’d offer that our security is the preeminent responsibility of our federal government. Yes, it can be done in a fiscally responsible manner, but it appears that General Petraeus has adopted the Obama maxim of national security strategy by way of obfuscation and denial. We are indeed running our men and women into the ground; that is not a myth. The fact that we have aviation maintenance crews searching boneyards and museums for spare parts is not a myth; we shared with you the catastrophic state of military aviation with you recently. The fact that we are stressing military families is not a myth — ask the spouses and children. The morale of our men and women in uniform is down…consider their being put on their knees at gun point by the Iranians, being buzzed by Russian aircraft, and harassed again by Iranian naval vessels. And this is happening under a president who is aiding and abetting the enemy by delivering to them massive amounts of cash. Hell, why not take the $400M and the $1.3B that was given to Iran, and appropriate it to our men and women in uniform, so they’re not using food stamps in commissaries?! And that is not a myth, General Petraeus. The time has come to stop looking at our military as the bill payer for the fiscal irresponsibility of Washington, DC. And when folks talk about the technology advantage we have, if we keep allowing our intellectual property to be confiscated by countries like China, the gap will close, and do so quickly. We need to restore our military and build its capacity from the bottom up, ask them what they need — not the defense industry. Heck, if you haven’t paid attention, the US Air Force is looking at a “next generation” fighter aircraft while we’re still struggling with the F-22 and F-35 deployment into the force. It’s not just about the next great gadget, but rather about the spirit of the warfighter, which is being deterred. Let’s reexamine the need for the service secretariats, you know, the massive defense civilian structure in the Pentagon. I find it absolutely astonishing that the three service secretaries only have two years of military service between them — a point I elaborated upon in the Townhall.com piece. General David Petraeus had an astonishing and impeccable military career, and his service in uniform cannot be argued. However, this latest assertion that the decimation of our military is a myth is a blatant lie. C’mon Sir, you can do better than that, unless you have been promised something by a certain presidential candidate…and why not tell us what really happened regarding Benghazi. 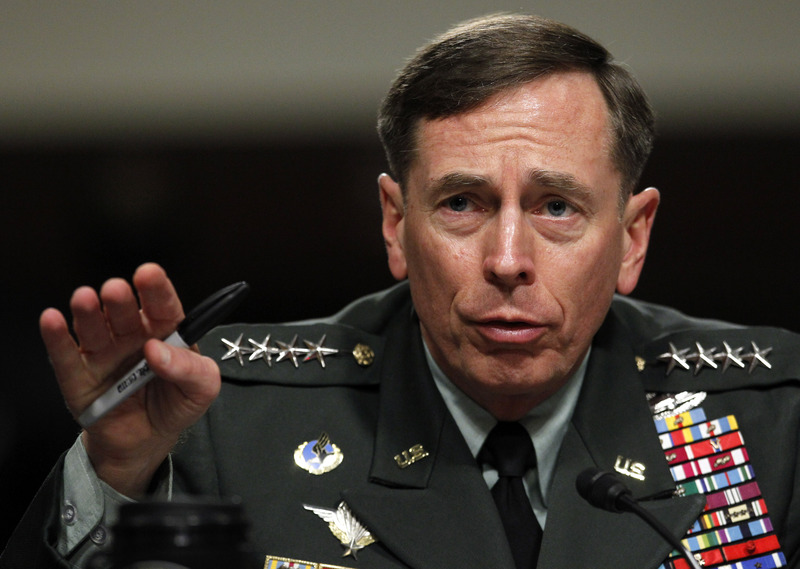 GENERAL PETRAEUS, YOU HAVE BEEN OUR HERO, WHY ARE YOU NOW SELLING OUT? IS HILLARY ASKING YOU TO SERVE? IN HER CABINET? ARE YOU SERIOUS BY SAYING WHAT YOU SAY “A LIE”? I HOPE YOU HAVE NOT LEARNED FROM OBAMA AND HILLARY TO SAY “LIES”? WE WOULD BE DEEPLY HURT. WE HAVE YOU ON A PEDESTAL, IT MAY CRUMBLE IF YOU ARE “SELLING OUT” DEEP IN YOUR HEART, I AM SURE YOU DO NOT BELIEVE WHEN YOU SAY “IT IS A LIE” PLEASE, YOU ARE SMARTER THAT THAT. It’s called blackmail and lies upon lies!! He-Mr. P- is running around dodging everyone and everything. He is a puss now, totally, afraid of killery, I guess with good reason, she kills. Forgot how? Life too good? OR JUST PLAIN YELLOW BELLIED???? Write home when you find Oz, and courage again!! 1. For my money, Allen West is a RINO. 2. Gen Petraeus attended the most recent Bilderberg conference. Do either of those sentences help?